Global Travel Media » Blog Archive » Wow – amazing shape! Is this the future of air travel? Wow – amazing shape! Is this the future of air travel? 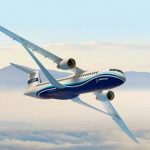 Winglets come in various shapes – but Boeing’s new “Transonic Truss-Braced Wing” redesigns the whole wing of an aircraft in radical way never seen before. The new wing, which comes with a truss (creating a very different look) is designed to be more aerodynamic and fuel-efficient, both being highly desirable 21st-century qualities. 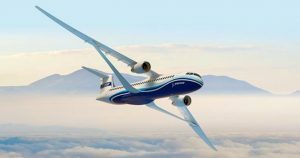 Boeing is studying the Transonic Truss-Braced Wing (TTBW) concept in collaboration with NASA as part of the Subsonic Ultra Green Aircraft Research program. Boeing revealed the newest TTBW, which researchers say will fly higher and faster than the previous TTBW concepts. The new configuration is designed to offer unprecedented aerodynamic efficiency while flying at Mach 0.80, which is 80% of the speed of sound, which equates to 980 km/h or 609mph. From end-to-end, the folding wings measure almost 52 metres. The high wingspan is made possible by the presence of a truss, which supports the extended length of the ultra-thin wing. Originally, the TTBW was designed to fly at speeds about 5% or 10% slower. To increase the aircraft’s cruise speed, the new concept now has an optimized truss and a modified wing sweep. By adjusting the wing sweep angle, the truss can carry lift more efficiently. The end result was a more integrated design that significantly improved vehicle performance. The new changes follow extensive wind tunnel testing at NASA Ames Research Centre. For nearly a decade, Boeing and NASA have been studying the concept as part of the Subsonic Ultra Green Aircraft Research (SUGAR) program. The research focuses on innovative concepts that reduce noise and emissions while enhancing performance.